"This book is the hardest one in the Bible to understand, I don’t think anyone completely understands it,” concludes Elaine Pagels,1 one of the world’s leading Bible scholars. The hard-to-understand book Pagels means begins with the three Greek words Αποκαλυψις Ιησους Χριστος, transliterated, “The Revelation of Jesus Christ.” This book, by the way, is the only one in the Bible that promises a blessing to those who read it. Hardest to understand for an accomplished scholar and the only book that boldly promises a blessing to its readers? If this is true, how can we read it so that its blessings will be unlocked? 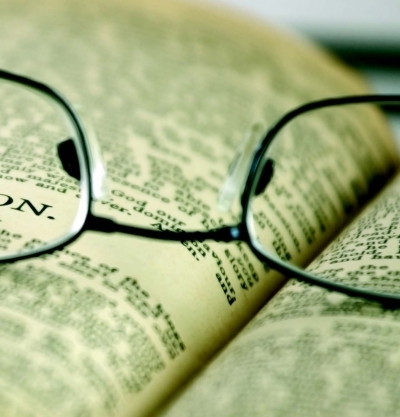 The first step to solving this riddle is to understand the literary structure of the book. Revelation is a prophetic book embracing the entire age of the Christian dispensation: starting in the time when Jesus revealed Himself to the Apostle John, down to the last age when the Lord returns and heaven and earth will be completely restored. Let us now postulate that if this book is indeed the Revelation of Jesus Christ, and if there is a blessing promised to the reader, then even a child should be able to understand it. The “apokalypsis,” meaning the uncovering, unveiling or manifestation2 of Jesus Christ is arranged in what scholars call a chiasmus or chiasm.3 These terms stem from the X-shaped Greek letter chi to denote a form of inverted parallelism. A chiasm can appear in poetry or prose and can include a single verse, an entire passage, or a more extended section. Chiasm is also referred to as ring structure, because the opening and closing of a chiasm can be viewed as completing a circle. Once one realizes that Revelation is arranged in chiastic text elements, there is certainly more than one way of drawing the lines exactly and thus defining the beginning and end for those elements. At a high level, there are four distinct elements that can be mirror-imaged onto each other, and a fifth segment that is imaged onto itself. The fifth segment provides the imaging plane for the entire chiasm: A, B, C, D, E, D’, C’, B’, A’, with “E” providing the imaging plane here. Picture a mirror on a table with four wooden letters standing in single-file in front of the mirror. The letter D stands closest to the mirror, C stands in front of D, B in front of C and A stands in front of B, farthest from the mirror. The mirror is the letter E. Each of the first four letters has a corresponding image in the mirror. Each one of the chiastic rings can be assigned a theme, i.e., a simple topic that briefly describes what the segment is about. If we read through the entire book of Revelation and then discover what those five themes are, we will get a surprising picture of the overall dual message of this book that not only reveals a most important message from Jesus Christ but truly manifests Jesus Christ Himself. It is interesting to note that John also uses a five-ring structure 4 in his Gospel (John 7:53 – 8:11). For I testify unto every man that heareth the words of the prophecy of this book, If any man shall add unto these things, God shall add unto him the plagues that are written in this book: And if any man shall take away from the words of the book of this prophecy, God shall take away his part out of the book of life, and out of the holy city, and from the things which are written in this book. He which testifieth these things saith, Surely I come quickly. Amen. Even so, come, Lord Jesus. The grace of our Lord Jesus Christ be with you all. Amen (Revelation 22: 18-21). What do these two elements A and A’ tell us, the blessed readers, about the last book of the Bible? Here is an analogy. In the manufacturing business there is a QA/QC (quality assurance/quality control) unit, and the people who work in this unit make sure that manufacturing process procedures are meticulously followed, that every step is carefully documented and all the raw materials and ingredients have a defined, traceable source or origin. This is obviously important to sustain a reliable product with a consistently high quality to the benefit of customers and consumers. For I have not spoken of myself; but the Father which sent me, he gave me a commandment, what I should say, and what I should speak (John 12:49). From the Son, the Word is entrusted to the angel, then to John, and finally from John to the churches. It is then the responsibility of the churches and their members to pass the information on to all people on the earth. This line of information relay ensures that the Word of God is trustworthy, dependable, pure, and as such a true blessing to all who hear it and put it to practice: “Every word of God is pure: he is a shield unto them that put their trust in him” (Proverbs 30:5). Indeed, the blessing comes from the purity of God’s Word, from God’s reliability, His trustworthiness. For the true endtime church this means that even when everything else will break, the Word of God will stand out in its integrity. Regardless of how many lies and how much corruption prevails, God’s Word can be trusted and will stand true and unaltered. John received the message that “the time is at hand” (Revelation 1:3). Some people try to discredit Revelation because they argue that things haven’t come to pass, even after 2000 years. What they fail to recognize is that the words of Revelation did not only come into effect in the 21st century; they already became relevant in the times of the Apostle John. Verse 11 states, “What thou seest, write in a book, and send it unto the seven churches which are in Asia.” Those churches were present-day churches at that time, and the messages of John were simple, pastoral letters. Jesus cared for the contemporary churches; we have to bear this in mind. But we must not forget that Revelation is even more relevant in our times, roughly 2000 years after John recorded all the words and visions he received from the Lord. God Himself has been the guard and protector of His Word. He signified it (Revelation 1:1), testifies of it (22:20) and will not let anyone go unpunished who attempts to tamper with it or alter it (Revelation 22:18.19). Why is this stern enforcement so important? He which testifieth these things saith, Surely I come quickly. Amen. Even so, come, Lord Jesus (Revelation 22:20). The answer is, Jesus will come back. 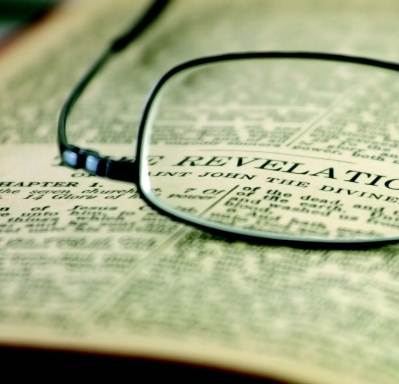 In the book of Revelation, Jesus Himself equips the Christian church with all the information it needs to escape deception and to prepare all those “that love his appearing.” Since His church has to fight the battle of the great controversy between good and evil, the Book of Revelation provides us with the intelligence, the vital information, to win the spiritual war; it clearly identifies the Remnant Church on one side and the forces of evil, the dragon, Babylon and the beasts, on the other side. And all who look forward to the coming of Jesus Christ will join in with John to say, “Amen. Even so, come, Lord Jesus!” How many Christians close their prayers with these words? I know that, whatsoever God doeth, it shall be for ever: nothing can be put to it, nor any thing taken from it: and God doeth it, that men should fear before him. (Ecclesiastes 3:14). Now therefore hearken, O Israel, unto the statutes (=H2706, prescribed task, portion) and unto the judgments (=H4941, act of deciding a case), which I teach you, for to do them, that ye may live, and go in and possess the land which the Lord God of your fathers giveth you (Deuteronomy 4:1). Only the land of the priests bought he not; for the priests had a portion (H2706) assigned them of Pharaoh, and did eat their portion which Pharaoh gave them: wherefore they sold not their lands (Genesis 47:22, emphasis supplied). (2) to make the right decisions. Ye shall not add unto the word which I command you, neither shall ye diminish ought from it, that ye may keep the commandments of the Lord your God which I command you. [..] Behold, I have taught you statutes and judgments, even as the Lord my God commanded me, that ye should do so in the land whither ye go to possess it. Keep therefore and do them; for this is your wisdom and your understanding in the sight of the nations, which shall hear all these statutes, and say, Surely this great nation is a wise and understanding people (Deuteronomy 4:2.5.6, emphasis supplied). Our task or portion prescribed by God, our mission, our function and place in the end-time game defines our identity. God’s statutes and judgments together become our wisdom and our understanding in the sight of the nations. God’s goal for the Adventist church is that the nations should say, “Surely this great church is a wise and understanding people.” Have we attained this goal yet; are we there? If not, what is the problem? For what nation (what church) is there so great, who hath God so nigh unto them, as the Lord our God is in all things that we call upon him for? And what nation (church) is there so great, that hath statutes and judgments so righteous as all this law, which I set before you this day? (Deuteronomy 4:7.8, emphasis supplied). "Remember ye the law of Moses my servant, which I commanded unto him in Horeb for all Israel, with the statutes and judgments. Behold, I will send you Elijah the prophet before the coming of the great and dreadful day of the Lord” (emphasis supplied). And in all matters of wisdom and understanding, that the king enquired of them, he found them ten times better than all the magicians and astrologers that were in all his realm (emphasis supplied). Daniel and his associates had been trained by their parents to habits of strict temperance.[..] No power, no influence, could sway them from the principles they had learned in early life by a study of the word and works of God (PK 482, emphasis supplied). It was the pure Word of God, the statutes and judgments they had learned, that equipped Daniel and his friends so that they could be a blessing in the court of the world’s greatest monarch at that time. The experiences of Daniel and his friends have a typological application for the end-time church. The words in the book of Revelation are God’s own words, and Revelation contains direct information from On High. And again, the blessing of this book is this: The Book of Revelation assigns the prescribed task to the Christian church; the role we, as members of His church, play in the grand scheme of historical events. It also teaches God’s judgment, divine discernment, so that we understand what is going to happen; so that we are always ahead of the end-time game. That’s where God wants us to be and He promised to give us the tools to get there. That’s the great reality of being part of the church, it makes us more significant than the richest and most powerful people on earth combined. And that’s the great news we should pass to our children on their own journey through life. Matthew Henry7 comments on Revelation 22:18-20: He that adds to the word of God draws down upon himself all the plagues written in this book; and he who takes any thing away from it cuts himself off from all the promises and privileges of it. This sanction is like a flaming sword, to guard the canon of the scripture from profane hands. Such a fence as this God set about the law (Deuteronomy 4:2), and the whole Old Testament (Malachi 4:4), and now in the most solemn manner about the whole Bible, assuring us that it is a book of the most sacred nature, divine authority, and of the last importance, and therefore the peculiar care of the great God. In this sense, it is no coincidence that inspiration determined the Book of Revelation to be the last book of the canon. The word of God is trustworthy. This is the message of the outer chiastic ring of Revelation, denoted A, A’ (see Figure). Like a shell, God’s assurance of trustworthiness encloses the rest of the message of this book. God’s statutes and judgments are our wisdom and understanding; like Daniel and his friends, this wisdom and understanding will enable us to surpass the wisdom of the astrologers of our time, so that we will be equipped for powerful witnessing. Is there a better preface or postlude to this important prophetic book? 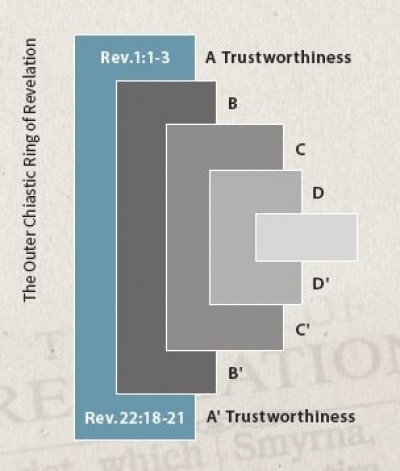 Now that God established the trustworthiness of His Word, we can read on and move to the next chiastic ring. 1. John Blake, CNN, “4 big myths of Book of Revelation”, religion.blogs.cnn.com (accessed 12/14/2015). 2. In Rom 8:19 (KJV) the underlying Greek word for manifestation is “apokalypsis” (Strong’s G602), the exact same word as in Rev 1:1. 3. Literary Forms in the New Testament: A Handbook, page 178, By James L. Bailey, available on books.google.com (accessed 12/11/2015). 4. “Larger Chiastic Patterns in John”, nazaroo.blogspot.com (accessed 12/16/2015). 5. Sun Tzu, The Art of War (New York: Oxford University Press, 1963), 144. 7. “Matthew Henry Commentary on the Whole Bible (Complete)”, biblestudytools.com (accessed 12/15/2015).